Amongst the three mushroom variants namely button, milky and oyster, the most nutritious mushroom is oyster followed by milky and then button. The fiber content is highest in oyster so it is most healthy. Demand for milky mushroom is also growing. “5 years before the spawn supply was 80% oyster and only 20% milky but now it has become 60% oyster and 40% milky. So demand is increasing for milky mushroom. It is certainly the future crop and growers must invest their time and energy in this business,” asserts Mr. A.R. Subramanian, founder, Maga Mushrooms. Maga Mushrooms was started in the year 1996 at Kovaipudur, Coimbatore, Tamil Nadu to grow oyster and milky mushrooms as well as spawns of these two variants. 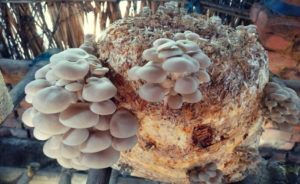 “I ventured into mushroom farming because it is not capital intensive and there is no large scale competition in this business. However it had been a roller coaster ride as in those days there was no production-technical assistance available. The farm was run with trial and error production techniques both for growing mushrooms and spawns. Yet as the demand of mushroom existed we could sail through the tough seven years without making any profits. It was only after 7 years the farm revenues improved a little. Since then there is no looking back. Another breakthrough came in the year 2008 when we started commercially supplying spawns to other growers. Now we are committed to develop new and low-cost technologies to have mushroom production all 12 months in a year, increase mushroom production and make it completely chemical free,” he shares. Initially the farm had 20 kg/day production capacity that is now increased to 120 kg/day. Spawn production capacity is 1500 packs/day, each pack weight 350 grams. There are 60-70 mushroom farmers in the network who regularly take mushrooms from Mr. Subramanian. Spawns are sold at Rs.28 per 350 gram pack (excluding transportation cost). The spawn price for oyster and milky mushroom is same. It is supplied across Tamil Nadu and parts of Kerala and Karnataka. Spawns are sent through bus service, it reaches within 12 hours at the grower’s location. Order quantity can vary from 10-3000 packs. Oyster mushroom spawns are always in stock while milky mushroom spawns are prepared on order booking 15 days prior from the delivery date. “We provide 100% guarantee for the spawns. The success in mushroom production process is dependent 20% on the spawns while rest 80% on the process,” he states. Oyster mushroom grows in the region where the atmospheric day temperature is 36 degrees while inside the room/shed the temperature is maintained at 26-28 degrees. On the contrary milky mushroom grows well in hot climate of 38-40 degree Celsius while room/shed inside temperature required is 32-34 degrees. Both mushroom variants need 80-90% humidity. Oyster mushroom is sold at Rs. 30-35 for 200 gram pack and milky mushroom is sold at Rs. 50 for 200 gram pack. Shelf life of oyster mushroom is only 2 days while milky mushroom lasts for 5-7 days. At Maga Mushrooms farm, mushroom beds are made from paddy straw as it is easily available in South India. Oyster mushroom grows in just 18-20 days and it is harvested in three flush. Milky mushroom takes 32-35 days to give the first harvest. It is also harvested 3-4 times in one cycle. Post harvesting mushrooms, the beds are used as organic manure in horticulture farms. “We give the beds to the farmers for free. People can decompose the discarded beds into manure. We are concentrating on spawn and mushroom production so we give it off for free however other mushroom growers can decompose the beds into manure and sell it commercially,” he states. Prospects of mushroom business are bright as demand is huge but still the overall success rate in mushroom cultivation is only 40%! It is due to production and marketing challenges. “In last 22 years I might have supplied spawns to 400 farmers but presently there are only active 60 farmers in the network. It is so because people discontinue the business due to production problems. Another issue is that mushroom production process is highly labour intensive,” he shares. Across India, mushroom has good awareness and it will definitely sell if sold through proper channel. Immediate plan at Maga Mushrooms is to launch ‘Ready to Fruit’ oyster beds to urban gardeners or farming hobbyist. “These days there is a new trend of having an organic terrace garden so this new product of ours shall be a new thing for these gardens. The bed shall have ¾ growth of oyster mushroom and it shall be ready to harvest after 10 days. We are still working on the technology to make the beds 100% organic and once we are able to do that these ready to fruit beds shall be launched. Mostly in 6-8 months from now the beds shall be available for sale. Size of the beds would be 12* 28 inch and it shall produce 1 kg oyster mushroom,” he reveals. Mushroom cultivation is a profitable business only when the entire process is done properly. “With reduced agriculture land and more protein based diet, demand of mushroom shall escalate. Consider it as professional venture, invest time to learn the intricacies and reap the rewards,” signs of Mr. Subramanian.